The elegant and recently renovated Antik City hotel is one of the best hotels located in the heart of the financial and business centre of historic Prague. 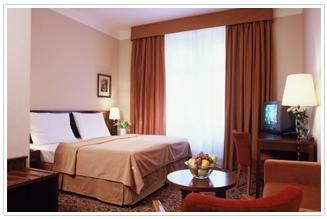 The hotel lies in the calm street of the New Town, near the Wenceslas Square. The accommodations are perfect for every kind of traveller, both for tourists and business men. The beautiful New Town of Prague was built in the 14th century by Charles IV, thanks to his big interest in the development of the town; he created one of the major and most beautiful cities of Europe. In the neighbourhood of the hotel there are some of the most popular monuments of Prague and a lot of shops and boutiques, where you can find the major international brand names, numerous great restaurants, cafes, bars and night clubs. Our hotel offers several marvellous services and we guarantee a special comfort to our guests. All rooms are accurate down to the smallest detail and provided with all the comfort; including free Internet connection. Moreover, we offer further services, like: a 24 hours reception desk, transfers to and from airport, vehicle hire service, reservations of tours and excursions in surroundings, reservation of admission tickets and the possibility of lending clothes irons, umbrellas. There is a small shop at your disposal and the luggage storage is free.